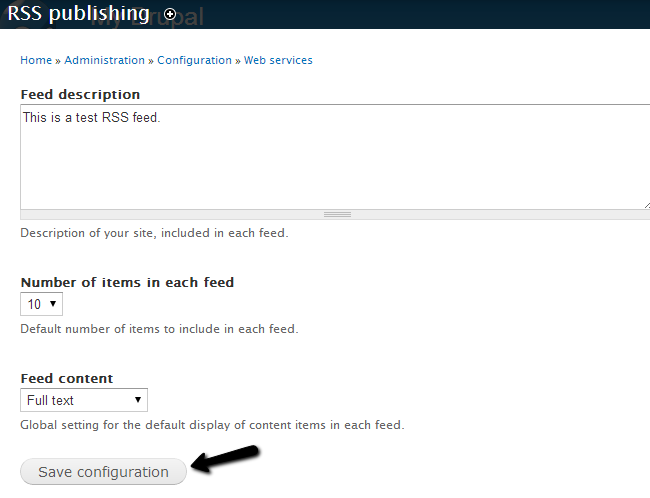 This tutorial will review the process of configuring RSS feeds on your Drupal website. You need to log into your website as administrator and then click on the Configuration tab from the main menu. Locate the Web Services section and click on RSS publishing. Feed description: Enter a short description for the feed. Number of items in each feed: Select how many items per feed. Feed content: Choose the content type for your feed. Click on the Save configuration button to keep the changes. Once you complete the steps above, you can use example.com/rss.xml, where example.com is the actual URL of your Drupal website.